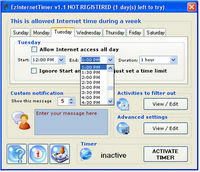 Computer Rental Controller allows you to easily rent or sell computer time on your computer. It offers two methods for renting time. The first method generates a list of passwords. Each password allows access to the computer for a period of time selected by you, and can be used only once. This allows you to sell the passwords, thus selling use of the computer for specific periods of time. 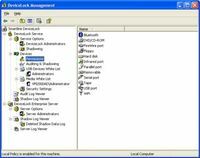 There are also administrator and supervisor passwords that allow unlimited access to the computer, as well as access to the Computer Rental Controller control panel. 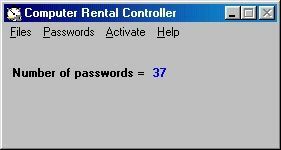 Using the second method, Computer Rental Controller allows you to create and store a list of permanent passwords. Each password can be used an unlimited number of times. When a person gains access to the computer using one of these passwords, Computer Rental Controller keeps track of how long the person is on the computer. It can then give a report of how long each person used the computer. This report lists each time they signed onto the computer and how long they were on for that session. You can then bill each person for their use of the computer at your convenience. Computer Rental Controller is useful in situations where you want to set up a computer that people can use for specific periods of time, such as an Internet Café or computer kiosk. It can also be used in cases where a parent might want to control how long a child uses the computer. Computer Rental Controller keeps running records of when the computer was accessed. This can be useful for business records.